Breaking the Rules -or- The Great Pumpkin Soup | Kitchen Mischief! So that, dear friends, is why I decided it was a marvelous idea to A) Purchase a whole pumpkin at the Pepper Place Farmers’ Market; B) Hack into said pumpkin, jack-o-lantern style; C) Fill the sucker up with broth and cheese and spicy goodness; and D) Roast the whole thing in the oven until it became an edible tureen. Oh, and E) serve it to company. I’d seen a recipe years back and had been dying to try it out. So what that I was breaking the essential entertaining maxim of “cook what you know.” I mean, what could possibly go wrong while roasting a 10-pound gourd full of boiling liquid? The pumpkin could collapse while roasting in the oven, dousing the heating elements with 7 to 9 cups of broth, cheese, and bread crumbs, which undoubtedly would find a way to catch fire, resulting in much cursing and requiring the procurement of a shop-vac. The pumpkin could collapse at the table, resulting in a tsunami of lava broth splashing into the laps of my guests, yielding at least second-degree burns, much yelling, and a potential head injury to a certain cross-eyed feline, who, when scalded by said broth splashdown, would take off like a cat rocket, likely straight into a wall or chair leg. But none of these things happened. Well…to be fair, the pumpkin did leak a little broth, but not a calamitous amount. 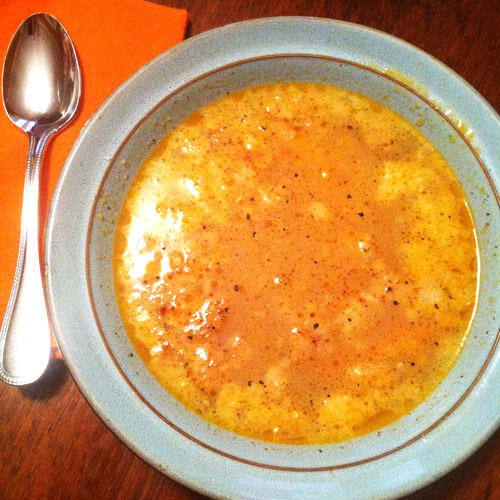 The soup was savory, rich, and comforting…a perfect bowl of fall goodness. Here’s what you need, and how to pull it off without injuring your friends and/or visually handicapped pets. 1. Preheat the oven to 350 degrees. Line a rimmed baking sheet with parchment paper. Set aside. 2. 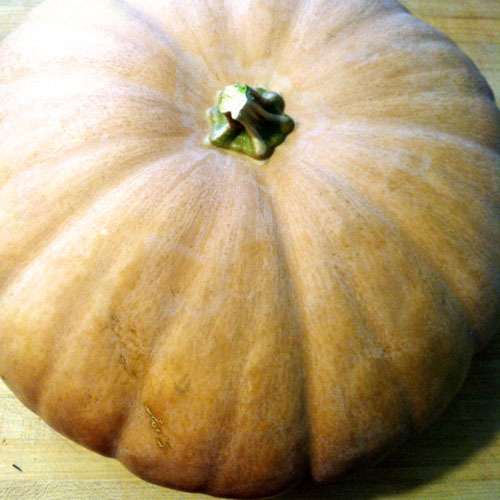 Cut the top off your pumpkin, and scape out all the seeds and stringy bits (like you would if carving a jack-o-lantern). Note: Do NOT carve a face into your pumpkin. Doing so would result in your pumpkin barfing soup out of its mouth, which is a novel yet impractical method of serving the soup. 3. Once all the stringy bits are gone (from the lid, too), rub the insides of the pumpkin with butter, and sprinkle evenly with fennel, paprika, and cayenne pepper. ** Lightly season with salt and pepper. Place the pumpkin on the prepared pan off-center, leaving enough space on the pan for the lid, eventually (we’ll get to that in a minute). 4. Add cheese, bread crumbs, and garlic. 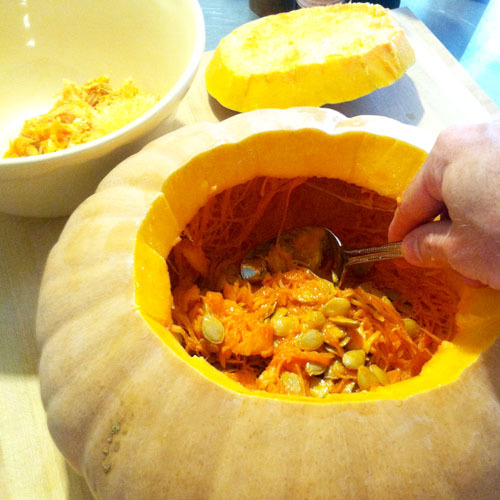 Add broth, filling to within 3 inches of pumpkin rim. (At this point, I’ll be honest; it looks pretty nasty. Just push through.) 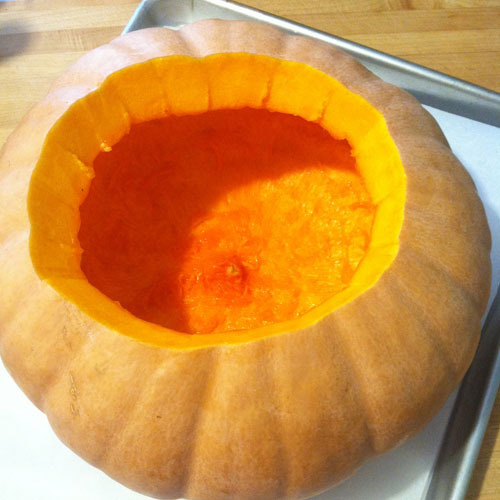 Place the lid on your pumpkin, pop her in the oven to roast for 1 hour. 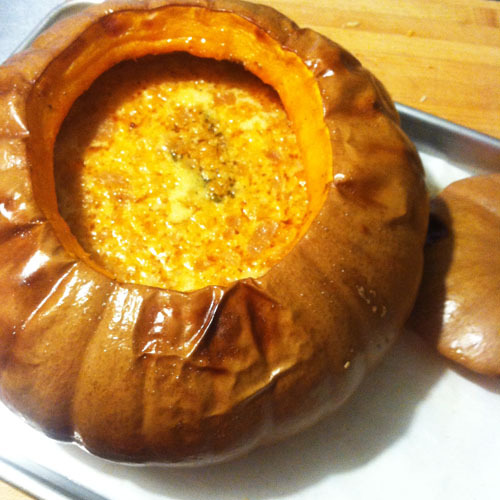 When filled with the broth and all that cheesy spicy goodness, this pumpkin is HEAVY. Move it mindfully, and use full-on oven mitts if you have them. Imagine the horror of burning your hand on the pan, hollering like a big woman, then flinging the hot-lava-pumpkin bomb into the air, spraying your walls (and your cat) with molten cheese and broth. Yeah. So be careful. Ta-da! To serve, ladle the broth into bowls. Then, using a spoon and starting near the rim of the pumpkin, gently scrape out spoonfuls of pumpkin, and divide among bowls. Season with additional salt and pepper, if desired. Garnish with extra cheese, of course. And that, friends, is it. Do I recommend that you tackle this project for a major event without practicing the recipe first? If I were editing this recipe for Taste of the South magazine, I’d caution no. But you know what? This is Kitchen Mischief, so why the hell not? It’s really not that hard. Just follow the instructions, and be careful. *So, about the spiders. A long time ago, somebody told me a story about picking up a discarded jack-o-lantern from their yard, only to find it infested with black widow spiders. Oh, the humanity!!! That horrific image is SEARED into my imagination, hence my irrational fear that any seemingly innocent pumpkin could be a WSD (Weapon of Squirrel Destruction). **Don’t feel hemmed in by my spice choices. Curry powder would be great, as would a good rich chili powder. This entry was posted on September 22, 2013 at 9:36 pm and is filed under Recipe. You can follow any responses to this entry through the RSS 2.0 feed. You can leave a response, or trackback from your own site. I heard how delicious this soup was and the presentation is beautiful. 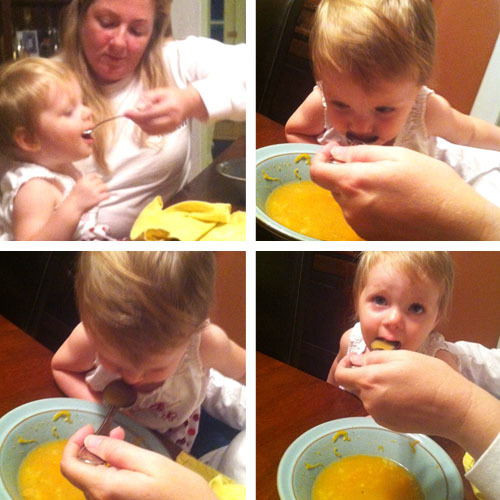 Thank you for the pictures of the princess and the fab recipe. This looks wonderful!! I’m thinking I might add some ginger……all of these recipes will be perfect for our next Polar Vortex! !